“Transport back to 2000” is the promise that SEGA is making to us by releasing the Dreamcast classic, Crazy Taxi, out on Android today. Anyone who owned a game console or walked into an arcade in 2000 knows what Crazy Taxi is. 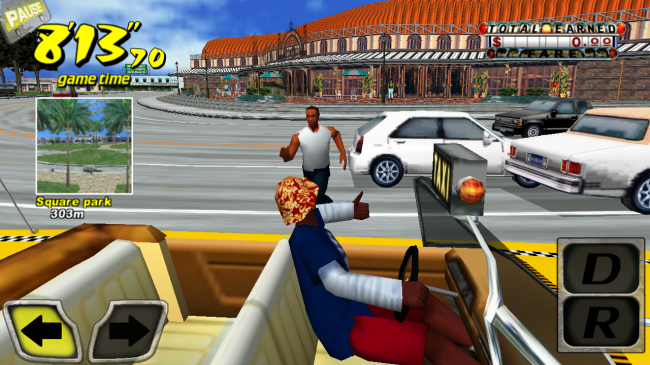 The game puts you in the shoes of an over-the-top cab driver who breaks almost every law in the traffic book to get their passenger to their destination as fast as possible. The game features Arcade mode for shorter playtimes or Original mode to let you play for a little bit longer. SEGA has optimized the game for today’s mobile processors and screens, while also adding in two different control modes. You can either steer by touch, or by turning your tablet/smartphone like a steering wheel. Throwing in new mini-games and the ability to listen to your own music playlists while driving, SEGA hopes to justify the $4.99 price tag that this app comes with. If you are looking to relive the old classic though, hit the link below and brush up on your driving skills.